The authors continue their exploration of innovative, and often obscure, art forms and crafts that exploit paper's unique characteristics. 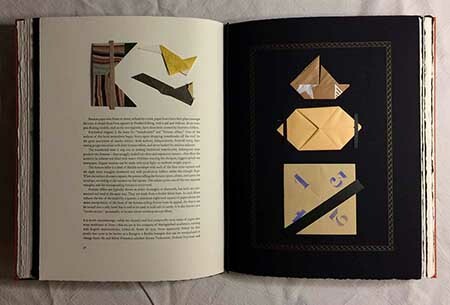 Turning their attention this time to folding (far beyond origami), this book details techniques and applications for ranging form computational geometry, to toymaking, to industrial packaging. The text is accompanied by approximately 150 tipped-in and removable samples, plus 15 three-dimensional structures described in the book, providing the opportunity to actually hold what is being described, to see how it’s constructed and works. Presented in a box with a lift-off top, the book rests on top of compartments holding the 15 structures, along with a magical Chinese thread box. Folding Paper (9.5 x 12.5 inches) a quarto-sized book, 80 pages plus tip-ins, set in Monotype Fournier and printed letterpress on Arches Cover paper. 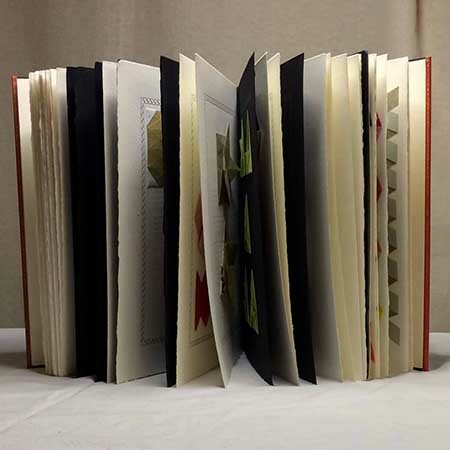 The book was bound by Claudia, in quarter leather and paste paper with onlays, leather fore edges and extensive gold tooling. The design and combination of materials are repeated on the box, with interior compartments arranged to snugly fit the samples included. The edition is 30 numbered copies signed by Claudia and Barbara, plus six A.P. copies.